The Best Muay Thai blogs from thousands of top Muay Thai blogs in our index using search and social metrics. Data will be refreshed once a week. Also check out Top Muay Thai Youtube Channels list for Top videos on Muay Thai. New York About Blog Hi I'm Sean Fagan and I’m the owner of Muay Thai Guy. I help you improve your training by supplying you with as much useful information on Muay Thai training, techniques, nutrition, mentality and the culture and tradition that makes the sport so unique. Facebook fans 825,242. Twitter followers 8,042. About Blog Muay Thai Authority is your source of the latest in fight media and news. Find everything related to Martial Arts. Muay Thai, Kickboxing, Boxing, MMA, Lethwei and more. Facebook fans 1,384,396. Twitter followers 743. Bangkok About Blog YOKKAO is recognized as the World's Premier Muay Thai brand. Read the latest Muay Thai News by YOKKAO Boxing, leading Muay Thai brand in Thailand. Fighters, Videos, Camps and Muay Thai Equipment Reviews. Facebook fans 651,436. Twitter followers 13,424. Thailand About Blog Muay Thai PROS is a website dedicated to muay thai enthusiasts around the world. Find Muay Thai Training Guides, Tips, Strategies, Muay Thai Camps, Fitness and Nutrition advice straight from Thailand. Facebook fans 233,552. Twitter followers 1,328. Thailand About Blog MuayThaiStuff.com is the online store for MuayThai products. We offer a wide range of Muay Thai products including MuayThai Shorts, Thai Boxing Gloves, Thai Shinguards, T-shirts and many more. Find posts and updates on Muay Thai. Facebook fans 294,595. Twitter followers 180. Bangkok, Thailand About Blog IFMA, International Federation of Muaythai Amateur, governing body for amateur muaythai. The primary objectives were to promote Muaythai as a cultural art form, self-defense, and ring sport; as well as to procure Amateur Muaythai inclusion into Southeast Asian Games (Sea Games), Asian Games, GAISF and Olympic Games. Find posts and updates on Muay Thai. Facebook fans 203,672. Twitter followers 38,968. About Blog MAX Muay Thai Official is the revolution of Muay Thai Tournament to international standard by bringing the best fighters from all around the world to compete in our MAX WORLD CHAMPION. Find videos on the best Muay Thai fighters from around the world to fight against Thais top ranking fighters. Facebook fans 164,621. Twitter followers n/a. About Blog Hi I'm Paul Banasiak. I am a Muay Thai fighter, boxer, and coach currently located in Bangkok, Thailand. I blog about everything Muay Thai, Travel Fitness, and Nutrition oriented. I forge a powerful mind and body through Muay Thai, Fitness, and Travel. Facebook fans 362,453. Twitter followers 496. Mueang Pattaya, Thailand About Blog Hi I'm Sylvie vDuuglas-Ittu. I am a female Muay Thai fighter/journalist. My Muay Thai blog focuses on my training and fighting in Thailand, but also my thoughts as a female fighter, sharing as much of the experience as possible. Facebook fans 27,768. Twitter followers 1,350. About Blog Hi I'm Laura Dal Farra. Muay Thai delivered by those who live it. I posts and update blogs on Muay Thai. Facebook fans 2,193. Twitter followers 13,744. San Francisco, CA About Blog Reddit is a community of millions of users engaging in the creation of content and the sharing of conversation across tens of thousands of topics. A sub-reddit for all things Muay Thai, news, upcoming events & general discussion. Facebook fans 1,168,859. Twitter followers 528,122. Bangkok, Thailand About Blog MuayTies connects the world of Muay Thai with HD fight videos from Bangkok's major stadiums, training footage, fighter interviews, docus and daily news. Watch the fights from the most famous Muay Thai stadiums as they happen. Facebook fans 280,934. Twitter followers 559. Phuket, Thailand About Blog Tiger Muay Thai and MMA Training Camp in Phuket, Thailand. Find indormation on Muay Thai, MMA, BJJ, Bootcamp, Yoga, Krabi Krabong and so much more! Facebook fans 978,054. Twitter followers 45,696. Facebook fans 388,558. Twitter followers 30,773. About Blog Hi I'm Kay. Muay Thai Citizen was originally created as an ongoing document of my personal journey in the world of Muay Thai. I bring the best in Muay Thai News, Gear Reviews, Training Tips, and Muay Thai Vacation Information. Lat Phrao, Bangkok About Blog Khongsittha is a renowned Muay Thai gym with quality accommodation in Bangkok. Learn Muay Thai and stay in a resort while experiencing Thai food and culture. Find information on all you need to know about Muay Thai, from training in Thailand, a fighter's diet, its history, and more. Facebook fans 16,309. Twitter followers 254. Khao Lak, Thailand About Blog Hi we are Tuk and Diana. Rawai Muay Thai camp in Khaolak Thailand offers Thai Boxing group classes for all levels. Find posts and updates on Muay Thai. Facebook fans 11,771. Twitter followers 312. About Blog Muaythai-World.com gives information about Muay Thai. Find videos of the best Muay Thai Fights, awesome Muay Thai Documentations and the latest News of Muay Thai. And also the Best Tips about Training, Equipment, Nutrition. Awesome Fights and Documentary Videos about Muay Thai. About Blog The WMC is the sole partner of IFMA (International Federation of Muaythai Amateur - the world governing body for amateur muaythai), and is a fully recognized member of the OCA (Olympic Council of Asia). We aim to expand the presence of muaythai within the sporting world and martial arts community. Facebook fans 190,344. Twitter followers n/a. Chandler Arizona About Blog Siam Fight Productions seeks to unite the best Muay Thai athletes, coaches, and fans throughout the world at the annual U.S. Muay Thai Open (USMTO) East and West Championships. The USMTO is open to amateur athletes worldwide and it’s goal is to prepare U.S. Muay Thai athletes for success in international competitions. Find posts and updates on Muay Thai. Facebook fans 14,653. Twitter followers 1,215. About Blog Hi I'm Nauzet Trujillo. I am a professional competitor of the school Shoothon Gym. Muay Thai Pro is a page with information for beginners of Muay Thai. Interviews, tips, videos and information about courses and events. Facebook fans 15,449. Twitter followers n/a. About Blog Muaythai Ontario (MTO) is an amateur sport organization whose goal is to provide Ontario athletes with development, education, competition, and support in the sport of Muaythai. MTO focuses on the development of proper technique and teachings of Muaythai and is committed to providing safe, regulated competitions. MTO provides philosophical and martial art teachings of the sport. Facebook fans 2,023. Twitter followers 208. About Blog Muaythai Canada is the sole recognized National Federation for Amateur Muaythai under the International Federation of Muaythai Amateur. We provide inforation to enable our athletes to succeed on the world stage by developing a standard for the sport and culture of amateur Muaythai through programs that provide the highest quality structural, educational, competitive, and financial support. Facebook fans 2,340. Twitter followers 205. Pattaya About Blog Kombat Group Thailand is Pattaya's best training camp for Muay Thai, Boxing, MMA, BJJ, Cross Training, Krav Maga & Weight Loss retreat that gets results. Find posts and updates on Muay Thai, Boxing, MMA, BJJ, Cross Training and Krav Maga. Facebook fans 6,984. Twitter followers 390. Facebook fans 9,618. Twitter followers 433. About Blog Brian Sargent is a personal trainer (NSCA-CPT), muay thai coach and fighter. Brian also is a Certified Personal Trainer (NSCA) and uses this knowledge along with Muay Thai to help others lose weight, sharpen their Muay thai skills, and conducts Muay thai seminars. He posts and updates blogs on Muay Thai. Facebook fans n/a. Twitter followers 118. Thailand About Blog Hi I'm Kevin P. Noone. I provide Muay Thai training in Thailand. I posts and update blogs on Muay Thai. Facebook fans 95,309. Twitter followers n/a. Chiang Mai, Thailand About Blog Santai is the number one Muay Thai gym in Northern Thailand. Find posts and updates on Muay Thai. Facebook fans 6,095. Twitter followers 25. Jacksonville, Florida About Blog Hi I'm Jackson. Jax Muay Thai is a full time Muay Thai Gym dedicated to providing authentic training in this powerful and fun martial art. We are dedicated to teaching real authentic Muay-Thai, ‘the science of eight limbs’, ‘the sport of Kings’, the beautiful ancient martial art of Thailand. Find posts and updates on Muay Thai by Jax Muay Thai. Facebook fans 1,180. Twitter followers 26. Colorado About Blog Factory X Muay Thai/MMA/BJJ, offers adult & kid's Muay Thai, BJJ, MMA, wrestling; a pro fight team, showering facilities, as well as CrossFit Littleton and Performance MMA on-site. Our Mixed Martial Arts, Muay Thai and Brazilian Jiu Jitsu courses are excellent choices for self defense, discipline. Learn more about Factory X Muay Thai community involvement, upcoming events, and other news. Facebook fans 5,179. Twitter followers 1,937. Birmingham, England About Blog Hi I'm Damien Trainor. I have practised the art of Muay Thai for nearly my entire life both in the U.K and Thailand, I aim to inform, educate and entertain fans of the sport through this web site. Facebook fans 5,857. Twitter followers 3,643. About Blog The new Bull Muay Thai Camp is located inside the Bamboo Pool Resort in the beautiful Ao Nang Beach in Krabi. This page is dedicated to all the news and events and also match done by Bull Muay Thai around all Thailand, from the youngest fighter to the most expert. Facebook fans 4,769. Twitter followers n/a. Houston, TX About Blog Houston Muay Thai is committed to giving you the best Martial Arts and Boxing experience. Find posts and updates on Muay Thai, Martial Arts and Boxing. Facebook fans 3,770. Twitter followers n/a. Florida & New York About Blog The Striking Corner, formerly Muay Thai is Life, is your source for all Muay Thai and Kickboxing news and content in the U.S. and Worldwide. The Striking Corner is dedicated to promoting the culture, tradition, and lifestyle of the sports of Muay Thai and Kickboxing worldwide. An in depth look at the sport's fighters, trainers, promoters, and fans! Facebook fans 54,550. Twitter followers 8,348. Newcastle, UK About Blog Muay Thai Blog more than just a 'blog' - Bringing the best of Muay Thai to you! Facebook fans 2,458. Twitter followers 1,145.
sydney About Blog Hi I'm Yolanda Schmidt. I now focus my time on training hard, mentoring others, teaching the ladies class at PTJ Muaythai Gym and remaining as active as possible in the fight scene. I post and update on Muay Thai. Facebook fans 7,492. Twitter followers 412. Lisbon About Blog Hi I'm Johnny FD. I am the host of the Travel Like a Boss Podcast, Entrepreneur, and Author of 12 Weeks in Thailand and Life Changes Quick. Follow my journey across Thailand as I train at the best Muay Thai and MMA Gyms. Facebook fans 3,598. Twitter followers 5,078. About Blog Find Gifs on Muay Thai. About Blog Hi I'm Gemma Pike. I posts and update on Muay Thai. Australia About Blog Hi I'm Natasha Sky. I am an Australian Pro Muay Thai Fighter. I have been training and fighting Muay Thai since 2008. I will be posting all sorts of blogs on this site about my good, bad and ugly experiences in Muay Thai and also Female fighter interviews. Facebook fans 5,624. Twitter followers 263. North Carolina, USA About Blog Eight Points Muay Thai is an authentic Muay Thai training facility in the Winston Salem, Triad area. We offer Muay Thai for both kids and adults, Brazilian Jiu-Jitsu, and Personal Training. Facebook fans 1,738. Twitter followers 271. Ventura, California About Blog We maintain being an active Muay Thai fighter while instructing my students of all different ages, sizes and GOALS. We post and update blogs on Muay Thai. Facebook fans 748. Twitter followers 208. About Blog Muay Ying was created out of a vision to deliver news straight out of Thailand, and to bring the community together and close the gap when it comes to keeping up to date with how the females are doing. Muay Ying will be a source that all can depend on for fights, news, and results on Muay Thai. Facebook fans 765. Twitter followers 9. About Blog The Fight Centre is home to many of Brisbane’s best Muay Thai fighters. We offer training on Muay Thai. Facebook fans 2,467. Twitter followers n/a. Pitt Meadows About Blog Scorpion MMA was founded by Dan Golkar, as a place where adults and children could train and hone their Martial Arts skills in a respectful, non-competitive, and safe environment. He posts updates on Kickboxing, Muay Thai, and Brazilian Jiu-Jitsu. Facebook fans 1,265. Twitter followers 43. Toronto About Blog At Training Ground we offer a variety of complimentary training methods and fitness programs that build on our Muay Thai foundation. We provide information on Muay Thai and much more. Facebook fans 1,355. Twitter followers 344. About Blog Hi I'm Craig. I posts and update blogs on Muay Thai. About Blog Hi we are Valentina and Antonina Shevchenko and we are the World Muaythai Champions. We post videos on Muay Thai. Facebook fans 215,144. Twitter followers 568,645. New York About Blog Hi I'm Sean and I'm addicted to muay thai. I'm the owner of www.muay-thai-guy.com and I hope to motivated and inspire people to chase their fight dreams. Follow along with muay thai news, training tips, techniques, equipment reviews, nutritional advice, thai boxing culture and more. Facebook fans 825,198. Twitter followers 8,043. About Blog Hi I'm Aaron Jahn. I am a Muay Thai fighter and coach. I created this site to provide muay Thai athletes with a credible source of training and Thailand travel articles to help people get the most from their time, improve performance and enjoy life. Facebook fans 385,328. Twitter followers 31,101. Los Angeles About Blog F5 is a unique gym. We offer small group classes and personal training in Muay Thai and Strength & Conditioning. The F5 blog is a source of education for F5 students and anyone interested in Muay Thai, strength training, healthy, nutrition, and a balanced lifestyle. Facebook fans 1,530. Twitter followers 634. About Blog York Muay Thai is an Authentic Muay Thai School, incorporating improvement of Mind, Body,and Spirit into the teachings of Muay Thai. We posts and update blog on Muay Thai. Facebook fans 1,296. Twitter followers 2,077. Brampton About Blog Traditional Muay Thai is the traditions of Thai culture, philisophy, and fundamentals connecting to the Martial Art of Thai Boxing. Brampton Muay Thai is a homegrown local movement dedicated to intense physical training, group classes, private classes and traditional Muay Thai instruction. Facebook fans 824. Twitter followers 444. Austin TX About Blog Ambush Muay Thai provides news, competitions, announcements, and recent events on Muay Thai. Facebook fans 427. Twitter followers 23. Bangkok, Thailand About Blog The Warrior's Travel Guide is a blog for life-hungry (combat) athletes who want to venture out into the world to chase their wildest dreams. I write about everything that has to do with Muay Thai (the main topic) and karate but every now and then I also make small trips to other martial arts such as the Brazilian Jiu Jitsu (BJJ) as many martial arts benefit and complement each other well. Facebook fans 134. Twitter followers 138. Santa Ana, CA About Blog CARRILLO MUAY THAI is the Only Muay Thai Boxing Institute in Santa Ana. Find posts and updates on Muay Thai. Facebook fans 258. Twitter followers 9. Richmond Hill, Ontario About Blog Richmond Hill Muay Thai is a Martial Arts school that focuses on, Muay Thai, Martial Arts culture, fitness, nutrition and healthy lifestyle choices. Read and follow some of the words of Kru Ryan, as he explains and provides insights on Muay Thai and Martial Art's Philosophy. Facebook fans 136. Twitter followers 35. About Blog MuayFight is a resource for those passionate about the sport and art of muay thai/thai boxing. I’m not a world champion, or even a highly experienced fighter, I’m just a guy who discovered muay thai in his early twenties and saw it change his life. I posts and updates blogs on Muay Thai. About Blog Muay Thai Obsession is my journey in the greatest Martial Art on Earth - Pro Fighter from Dublin fighting out of Melbourne. I posts and update blogs on Muay Thai. About Blog Hi I'm Jillian Bosserdet. I have trained Muay Thai for a little over four years, fought 8 times and I became a trainer. I post and update blogs on Muay Thai. About Blog Hi I'm Marloes Merza. I am a Muay Thai Fighter / Personal Trainer. I posts and update blogs on Muay Thai. About Blog Find Muay Thai, MMA and Fitness training info from Phuket, Khao Lak, Phang Nga, Thailand and More. Poland About Blog Hi I'm Milena. I am a 30yr female training Muay Thai in Poland. I share my story is about my passion and immersion into the art of Muay Thai and observing how the Polish Muay Thai scene develops. I also posts useful links to the Muay Thai community. About Blog Sensei Says is the muay thai and martial arts blog of PHAS3 Martial Arts, a muay thai focused martial arts school in Santa Rosa, California. About Blog Hi I'm Amanda Swanson. I posts and update blogs on Muay Thai. About Blog Find videos on Muay Thai and Kickboxing. About Blog Find videos on Muay Thai. 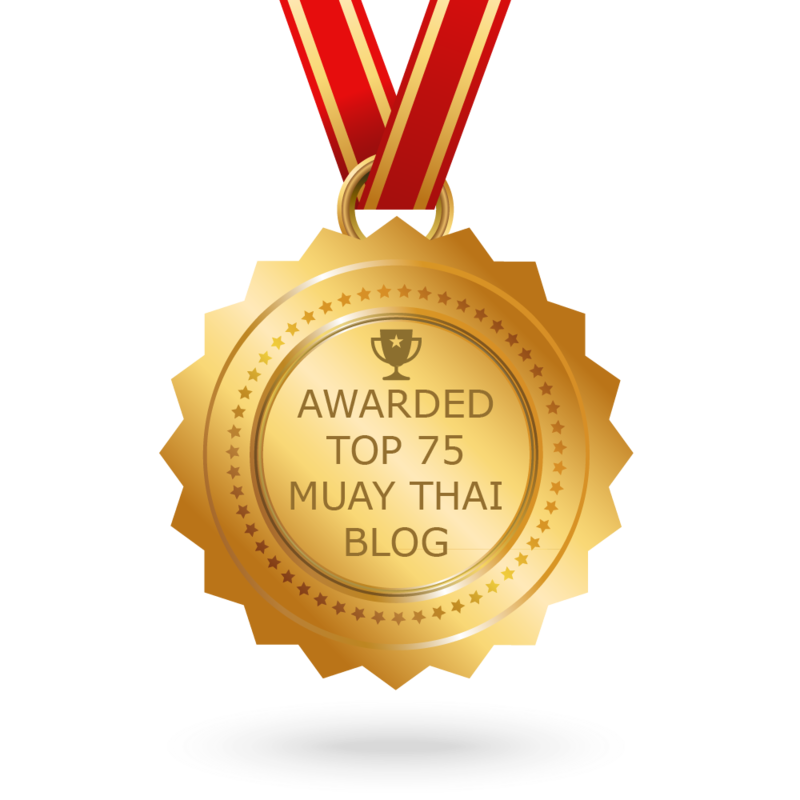 CONGRATULATIONS to every blogger that has made this Top Muay Thai Blogs list! This is the most comprehensive list of best Muay Thai blogs on the internet and I’m honoured to have you as part of this! I personally give you a high-five and want to thank you for your contribution to this world.